Each jewelry piece is handcrafted with your choice of sand and may take up to 3 weeks to deliver. 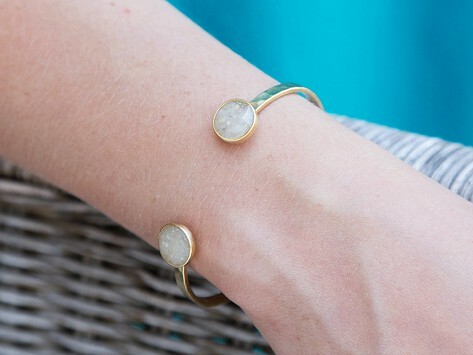 Capture and carry your favorite beach in a custom sand cuff. Dune’s handcrafted cuff features two capsules of sand that are sanded and trimmed with sterling silver for a domed, gem-like finish. Choose from their collection of sand from over 1,500 beaches worldwide or send your own grains from a special beach, golf course, ballpark, or trail. Dimensions: 2.5" x 0.5" x 2"
Arrived guickly and it was just as pictured. I will probably be ordering bracelets for my daughters.